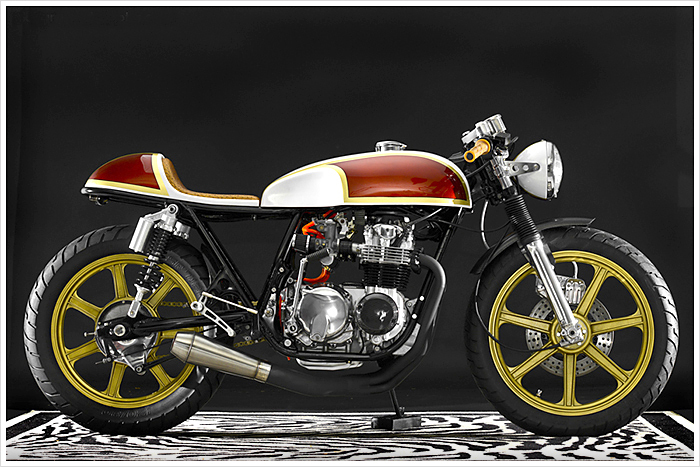 This pretty little thing is named ‘Lucy’ and she is the 15th café racer built by Hot Sake Cycles in Orlando, Florida. We were surprised we hadn’t heard of them before, but that’s probably because ‘they’ are actually a single guy named Shannon Hulcher who builds these professional-looking bikes in his spare time. By day he works as a biology teacher who dissects frogs to show kids how the body works. By night, he dissects motorcycles to show the rest of us how to build a café racer. “I don’t have a professional shop” says Shannon. “Lucy is a culmination of skills I’ve been developing over the years”. I wanted to build an ultra light weight bike that would be fun to ride. The whole goal was to make it as light as possible” he says. He started the build with no deadline, but then Cafemoto Orlando asked him if he could finish it for the AIM Expo. With the show only one month away, Shannon got to work.